...We want to know, too, so share with us your knowledge, experience and thoughts. Looking forward to your proposals! 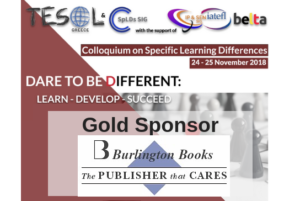 TESOL Greece with the support of IATEFL Inclusive Practices and Special Educational Needs (IPSEN) SIG and BELTA Belgium brings you the International Colloquium on Specific Learning Differences: “Dare To Be Different: Learn, Develop, Succeed“. 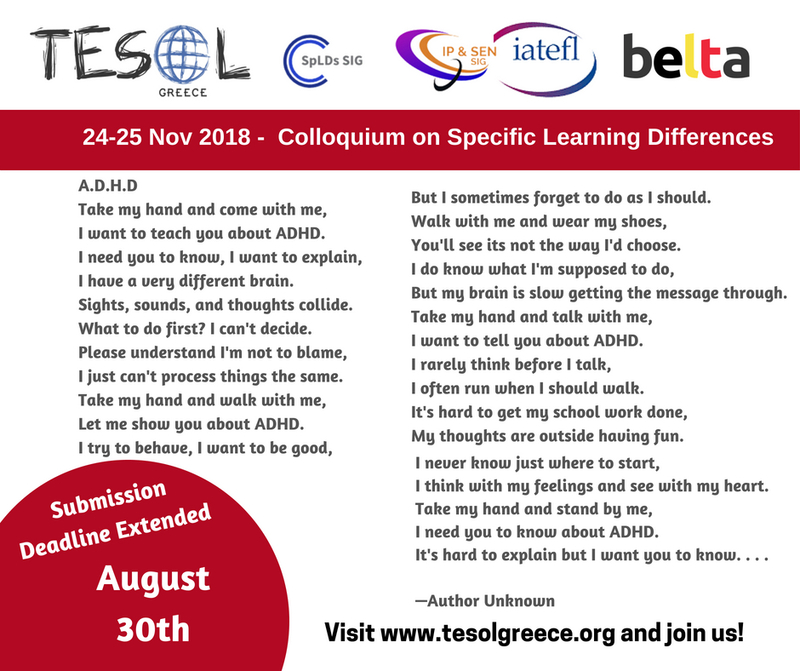 TESOL Greece and the Specific Learning Differences Special Interest Group (SpLDs SIG) aim to inform, support and empower English Language Teaching professionals who are faced with the challenge of teaching learners with a variety of specific learning differences. We encourage submissions which will discuss and focus on developing the strengths and interests of the learners and improve the quality of learning. Please note that a professional presentation should not be used to advance a book, publisher, author, course or examination. TESOL Greece Members are particularly sensitive to the distinction between commercial and professional presentations. A Practice-Oriented presentation, which shows, rather than tells. The presenter helps participants solve a problem or develop a specific technique through a series of structured hands-on activities. • All presenters will refrain from changing the content of their session once it has been approved. • Provide handouts for the anticipated number of attendees. 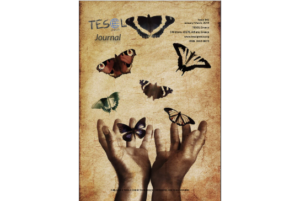 • No presenter can refuse attendance to any TESOL member. Please fill in the online application form: https://goo.gl/D2pgoh by August 20 August 30th, 2018. We would like to inform you that handwritten or typed summary information faxed or mailed to the TESOL Greece office cannot be accepted . For your convenience, you can fill in and submit the online form. Feel free to print out this letter and post it in your office or staff room. 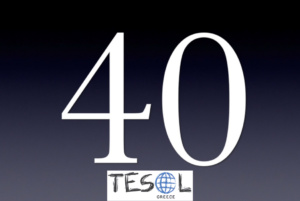 On behalf of TESOL Greece, we thank you for your interest. We are looking forward to seeing you at the Colloquium.